Despite lawsuits, threats, and political attacks, the city is forging ahead with plans to create a consortium of cities that would adopt its anti-foreclosure plan. 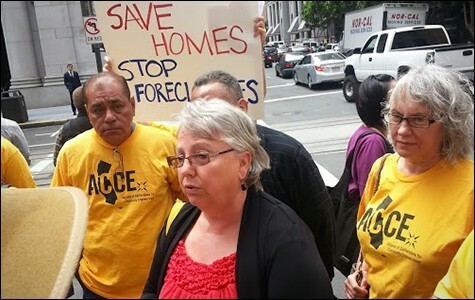 Mayor McLaughlin has been on the frontlines of the anti-foreclosure movement nationwide. Ever since Richmond unveiled its groundbreaking proposal to seize distressed mortgages from banks in order to help keep residents from losing their homes to foreclosure, powerful outside interests have waged war on the city. Big banks and Wall Street investment firms have sued Richmond, claiming that its plan is illegal. Housing agencies have threatened to freeze loans and force the East Bay city of 100,000 people into another recession. And real estate interests have attacked the Bay Area investment firm — Mortgage Resolution Partners (MRP) — that has been working with the city on its anti-foreclosure plan. And then earlier this fall, glossy mailers blanketed Richmond as part of a smear campaign against the city's proposal. "Wall Street is back to take another bite" out of your home, the mailers warned. "The Council's heart is in the right place — they are trying to help Richmond homeowners struggling to save their homes, but they've bought a risky plan that could seriously harm the value of your home." The mailers were financed, in part, by a $70,000 donation from the California Association of Realtors. The National Association of Realtors also provided financial backing, but did not disclose how much money it gave to the campaign. The flyers were produced by the same political campaign consultants that organized the anti-soda-tax campaign last year on behalf of major beverage companies. 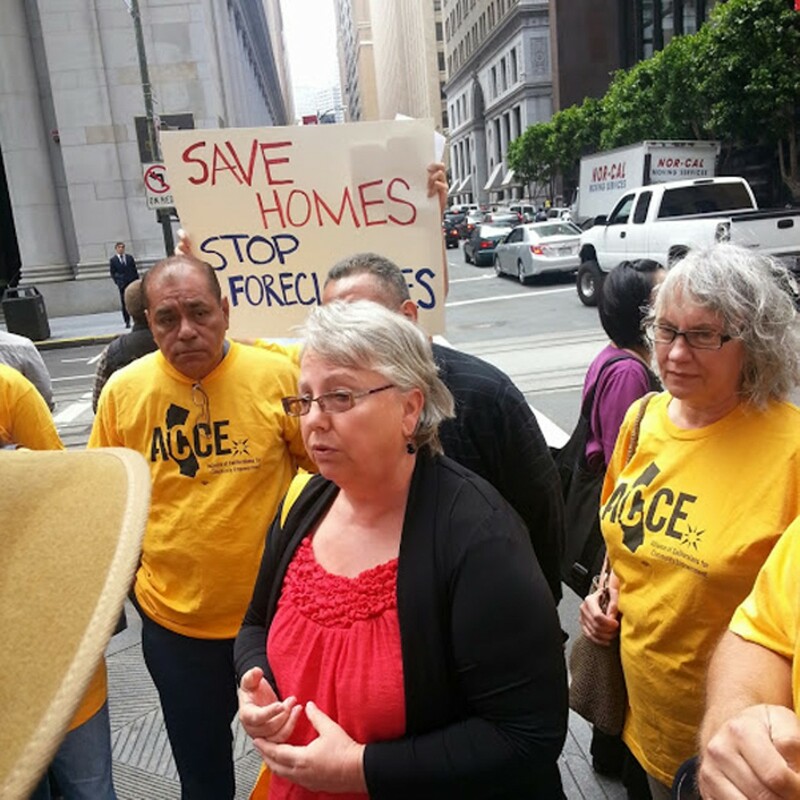 "How shameful is it that some of these state and national associations are trying to meddle and interfere in Richmond's program," said Amy Schur, executive director of Alliance of Californians for Community Empowerment, an economic rights group that supports the city's plan. "This is a community that has come up with a solution to the mortgage crisis that's in their own control." But despite the attacks by Wall Street, Big Banks, and real estate interests, Richmond is not giving up. The city is forming a coalition of municipalities interested in similar foreclosure prevention programs. And MRP is working to create a Joint Powers Authority with at least five other jurisdictions in California — a move that would allow the individual governments to legally act as one. In short, what started as a local campaign to save struggling homeowners could balloon into something much bigger. "With the support of other cities we can really provide that leverage to get the banks to come to the [negotiating] table," said Mayor Gayle McLaughlin. "I'm thinking this is now gaining the momentum that we need in terms of creating a national movement." Although the Bay Area housing market has roared back to life during the past eighteen months, Richmond and many other cities have not yet fully emerged from the foreclosure crisis. Currently, about half of Richmond's homeowners are still underwater on their mortgages — that is, they owe more than their home is worth. Vicky Conway is one such homeowner. The lifelong Richmond resident bought a house with her husband in the North & East neighborhood of the city in 2004 for $325,000. She estimates it's now worth less than half what they paid for it. "We're not going to be able to retire and continue with the same mortgage payments," she said. Thousands of Richmond homeowners are in a similar position, and to prevent another wave of foreclosures, the city has proposed buying 624 underwater mortgages at fair-market value. If the banks refuse to sell the mortgages, the city has threatened to invoke eminent domain to seize them. The city and MRP would then refinance the loans and lower the monthly payments so that residents like Conway could remain in their homes. Realtors, banks, and investment firms, however, worry that the program would set a national precedent — and that other cities would follow in Richmond's footsteps. Banks, as a result, could take a financial hit. And real estate organizations worry that mortgage loans would dry up in Richmond and other cities that adopt its plan, thereby harming the housing market in those areas. Such fears have sparked a flurry of opposition. The securities industry said that if Richmond follows through with its plan, borrowing costs could increase. The regulatory agency overseeing Fannie Mae and Freddie Mac also threatened to restrict or cease business activities in the area if the city moves forward. "Not only will this plan freeze up the residential credit market, it's also making it fairly difficult, if not impossible, for the city to conduct its normal municipal borrowing practices," argued Chuck Finnie, vice president of BMWL & Partners, the consulting firm that organized the attack mailers. "This thing is a house of cards that's about to come down." And in an apparent attempt to stop Richmond's plan from spreading, a consortium of banks and investors have not only sued the city, but also have indicated that they will target seven other communities that are seriously considering the program or are already working with MRP. And although a federal judge dismissed the lawsuit because Richmond had not yet started seizing mortgages, the city will almost certainly face more litigation if it moves forward with its plan. To shield the city from potentially devastating legal costs, MRP is trying to organize at least five other cities into a Joint Powers Authority, which would allow the separate governments to act as one in court. This would provide another layer of protection for Richmond. "These are big companies — they have a lot of power. They have a lot of money," said City Councilmember Jovanka Beckles. "None of us as individual cities can do it alone, but when we band together, we can actually do this." If the alliance forms, it would mark a turning point for Richmond's program: It no longer would be locally based, and therefore could help thousands — perhaps tens of thousands — of underwater homeowners across the state. The Joint Powers Authority could also make banks and investors more inclined to negotiate a sale of the targeted mortgages, allowing Richmond to avoid having to seize them. "Eminent domain is most definitely a last resort," McLaughlin said. "We continue to call on the banks to sell us the loans voluntarily." This isn't the first time MRP has tried to assemble a Joint Powers Authority. Last year, San Bernardino County and two Southern California cities that were pushing for a similar foreclosure prevention program, formed a JPA for legal protection. The coalition, however, eventually decided against using eminent domain to seize mortgages. McLaughlin said that the Joint Powers Authority that Richmond is trying to assemble would not back out of the plan like San Bernardino. "[They] didn't have a grassroots effort underway, so Wall Street was able to put out their attacks with no voice countering their lies and misinformation," she said of the previous attempt. Richmond, however, has "a great on-the-ground community effort in place." The movement doesn't only appear to be gaining traction in California, but also throughout the country. At a rally last weekend, the mayor of Irvington, New Jersey announced that the working-class city would analyze a plan similar to Richmond's. And the cities of Yonkers, New York and Newark, New Jersey are considering the use of eminent domain to prevent foreclosures, according to The New York Times. McLaughlin also recently spoke with civic leaders from eighteen cities considering similar plans. A few of those cities, including Seattle and Baltimore, are "well down the path towards adopting a similar program," said MRP Chairman Steven Gluckstern. Oakland also is considering lending its support to Richmond. Councilmember Desley Brooks authored a resolution that would express solidarity with Richmond, a city she believes "has had the courage to do something bold." Councilmember Rebecca Kaplan is pushing for a separate plan that would analyze Richmond's program with the hopes of potentially emulating something similar down the road. The Oakland City Council was scheduled to discuss both proposals on November 19. "A lot of other cities are stepping into the fray, which is essential," said Schur, of ACCE. "Wall Street thought that if they kept [the plan] isolated to Richmond they would've had a much better chance of crushing it, but they've failed." The Richmond City Council plans to revisit the issue sometime in December, and Gluckstern predicts the JPA will be assembled by then. As for Conway, she's counting on the city to not give up. She and her husband live on a fixed income, and while they've been able to stay current on their payments, they're in a precarious position — any unforeseen expense could push them out of their home. "I'm hoping that something is going to give one way or the other — either the banks work with the city or the city goes down the eminent domain road," she said. "Either way, I'm holding my breath."